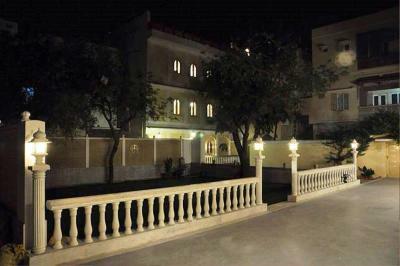 Lock in a great price for Khatu Haveli – rated 9.1 by recent guests! Located in the heart of pink city. A great view of forts from the terrace. Heritage property. The hosts give every guest personal attention. Historic building, very well maintained and nicely decorated. The bathroom wasn't just clean it was ultra-clean. There was nothing to complain at all, and I'm a big complainer. You have to be aware though of the very steep steps in the Haveli, dinner is served on the 3rd floor. Food was good. Breakfast is made fresh for the guests and the dinner at the rooftop terrace was delicious. Owner and staff were friendly and very helpful. Would definitely recommend this charming place! Wonderful Haveli in Old City of Jaipur. Excellent hosts and staff. Great roof top views of city and a Tiger Fort. Owners were great hosts. Staff was excellent. Dinner on roof-top terrace amazing. They bent over backwards to make us comfortable. Location in old city very convenient to most major in-city sites. A lovely haveli is situated in the old part of the Pink City, close to many of the palaces and forts. Clean, spacious rooms with all the amenities. Excellent breakfast. Would definitely recommend. Lovely hotel with a great view from the rooftop. Food was great. Free pick up from train station. I stayed at Khatu Haveli for four nights in November. The Khatu is a beautiful old residence that has been in the family for generations filled with history and charm. I appreciated the complimentary pick up from the train station to the property especially since my train was an hour late. The owners very kindly served up a beautiful dinner even though the kitchen had closed an hour earlier. My single room on the top floor was calm and clean and airy and the breakfast each morning was freshly prepared and delicious and met my vegetarian restrictions. Khatu Haveli was right in old Jaipur and it made exploring the city quite easy. The Internet service was touch and go but worked when I needed it to. 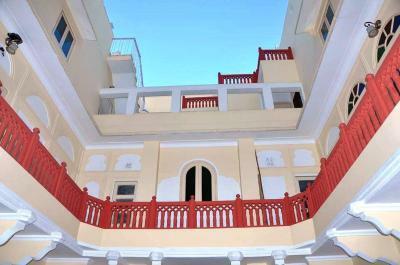 Khatu Haveli This rating is a reflection of how the property compares to the industry standard when it comes to price, facilities and services available. It's based on a self-evaluation by the property. Use this rating to help choose your stay! One of our top picks in Jaipur.Khatu Haveli is a heritage property built in the 19th century has 3 courtyards and magnificent arches and terraces. It is located in Jaipur, just 0.9 mi from Nahargarh Fort and 6.2 mi from Jal Mahal Palace at Mansagar Lake. Free WiFi internet access is available throughout the hotel. The air conditioned rooms at Khatu Haveli include flat-screen satellite TV and an electric kettle. They also include an private bathroom. Interconnecting rooms are available. The hotel restaurant specializes in serving regional and continental cuisine. 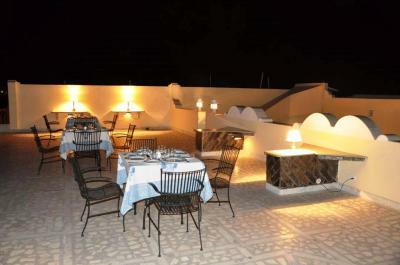 The main terrace of the property offers views of the famous Nahargarh Fort. Khatu Haveli is 1.2 mi from Jaipur Train Station, 0.9 mi from the bus station and Jaipur Airport is 7.5 mi away. The property offers free public parking on site. 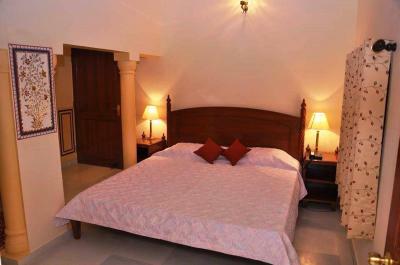 When would you like to stay at Khatu Haveli? This room has air conditioning, flat-screen satellite TV, and an private bathroom. This single room has a sofa, air conditioning and mini-bar. House Rules Khatu Haveli takes special requests – add in the next step! Khatu Haveli accepts these cards and reserves the right to temporarily hold an amount prior to arrival. The high steps and lots of stairs but made it up to the top floor a couple of times. A lovely oasis in amidst the chaos of Jaipur. The staff were lovely and couldnt do enough for you. The food was good. Would go back for more. hotel was great room very comfortable and view from top of hotel great. The owners were always present to answer questions and were very helpful. View from the rooftop was amazing. the staff was extremely friendly and helpful, even when we arrived in the middle of the night. The room was spotlessly clean and the bathroom was spacious. The Hotel was just great. The Haveli was fabulous, very clean and tidy, the brigadier, his wife and staff were all very friendly and courteous, nothing was too much trouble, we had breakfast and dinner there once both were lovely, I would highly recommend this as a place to stay whilst in Jaipur. The room was dark dank and very noisy at times. We felt like we were guests in someone’s home. If your legs aren’t too strong, best to book a room on a lower floor. A lovely Haveli. Our room was on the very top floor and next door to the roof terrace which has fabulous views of Tiger Fort. The host, Brigadier Singh kindly sent an auto rickshaw to collect us from the station when we arrived. This was Darshaan who took us to the Amber Fort and Tiger Fort the next day. He is an excellent driver, trustworthy and charged a reasonable rate for ferrying us around all day. We were very happy with him. Breakfast at the Haveli is good and we had dinner there too. This was a buffet of some delicious curries.. We very much enjoyed our time at the haveli. It was a tad cold. ( but it is January,after all ). Very friendly owners and staff. Really comfortable atmosphere, almost like part of a family. Breakfast and dinner both good. We loved everything about this Haveli but the stairs did not get any easier over the week. Ambience, the staff , the room, location and the food especially the breakfast.